When I wrote the piece I called ‘Snap Happy Birders’, I knew I had set the neighbour’s cat amongst my pigeons, but I didn’t expect the pigeons to come home to roost quite so fast, nor so close to home. 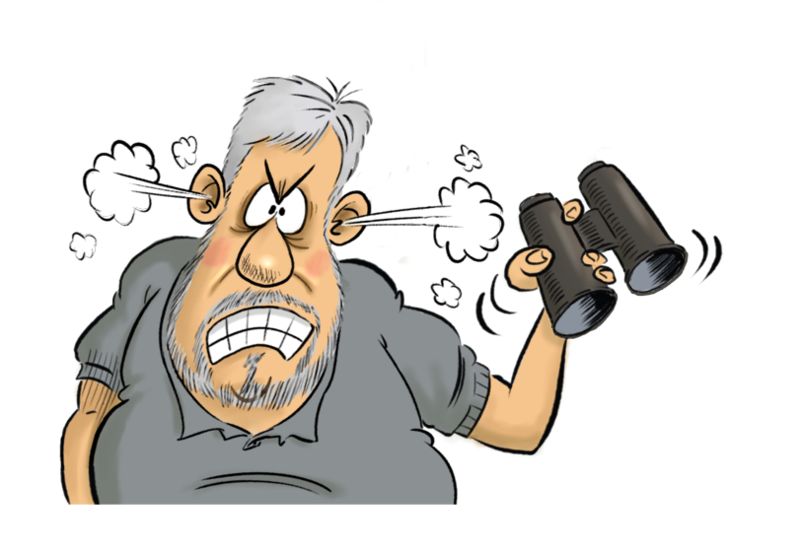 Birdwatching’s postbag filled and the debate raged on over a number of issues… not too surprising perhaps as it is an issue which seems to polarise people. However, I want to make it clear that I didn’t set out to ‘diss’ birding photographers, or any photographer come to that. I knew I had been misunderstood or misinterpreted when my own son (birder first, photographer more recently) said ‘well, if you feel like that, you can take my photos off your website’! I make no apologies for that piece as it did not lump all photographers into the bird disturbing bracket any more than my condemnation of twitchers, who pay no respect to householders and landowners, disses all birders. What I condemned is a certain sort of behaviour most often borne of ignorance, but occasional flaunted in selfish arrogance. There are millions of birders who photograph birds, some awe-inspiring, many excellent, some adequate and quite a lot that are risible. There are many photographers who research their subject matter and heed their needs. My attack was on those people who disturb through thoughtlessness or selfishly put the picture above the welfare of their subject and the wishes of fellow hobbyists. As some respondents pointed out, such behaviour can be exhibited by crass birders too. I know that some birders occupy a hide for hours and many enjoy loud birding craic when I am hoping to tranquilly enjoy a mud-probing crake. I accept that, generally noise, which is not sudden is pretty much ignored by birds and that photographers have as much right as I do to occupy my favourite bench. However, there is some evidence that the constant whir of shutters can disturb… one reserve has even blocked off some hide slots because they have come to believe that camera shutter noise was disturbing some kingfishers’ breeding attempt. Having related this to a photographer I was told that it was rubbish… but then I’ve also been told that my assurance that dog-walkers using footpaths disturbs birds is nonsense despite research absolving me. I’ve seen birders stick their scopes out of hide slots too, when signs warn against sticking camera lenses through the hide window. It’s called a hide for a reason! I’ve watched birders try to get too close to their quarry, such stupidity is not confined to those toting cameras, birds are flushed by the too close approach of any sort of long-lens with an idiot at one end. The lens is what should make the birds detail apparent not getting within touching distance. Just like birders needing field-craft, dedicated photographers take hours to creep close, often in an uncomfortable hide. Fools rush in! We all have our prejudices, preferences and blind-spots, but public reserves can only function if we are all prepared to modify our behaviour when it ruins someone else’s enjoyment. Even if this was not the case the one yardstick none of us should ever ignore is the welfare of the object of our observation. Wonderful images of birds recruit support to conservation as well as just giving us something uplifting to view, and keep John Craven in work promoting the BBC Country File Calendar. All I call for is responsible behaviour, and each of us has a responsibility to nudge those who err from ignorance into a righteous path. Dammit, I even tolerate cat-owners… so long as they keep their pets indoors. But that’s another story.